I have been associated with Arthur Hull and Village Music Circles since 2000. 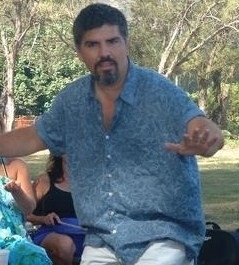 It was in the summer of 2000, at a conference I was hosting, where I first participated in a drum circle intended to bring a large group together as a team. I was intrigued by the process, the drum, the rhythms and how I felt during and after the event. I found the combination of intention for a team/community experience, the explosive rhythm spontaneously created by the group and the ability of the facilitator not only to facilitate our drumming, but also facilitate our human spirit. Everything I knew was possible in a group setting was as obvious as the moon and the stars from the beach at night on the North Shore of Oahu. It was there, on the North Shore of Oahu that I attended Village Music Circles Facilitators Playshop, only a month since that first drum circle. I still attend that Playshop every year, but have become part of the staff of Village Music Circles. I created a Mentor Experience for returning Playshop graduates who wanted to further their leadership, mentoring and interpersonal skills. I also co-facilitate the Drum Circle Facilitation portion of the workshop with Arthur. We've led this 10 day workshop experience over 14 years in Hawaii, 3 time in Scotland and in 2015, Japan. I volunteer in various community settings bring community through Rhythm. You can usually find me at the Folklife Festival in Seattle in May and the Seattle World Rhythm Festival in June, in addition to August in Hawaii with Arthur.